notebook fillers. i remember the first time i have used these thin notebooks were in high school. to my surprise my grade 2 schooler has been supplied with this kind of notebook this school year. how on earth can we expect a 7 year old handle such a flimsy notebook with enough care for it to last for one term at least? i would imagine it would take a few hours or minutes of handling before the poor little fillers start tearing apart. so what’s a mommy got to do? 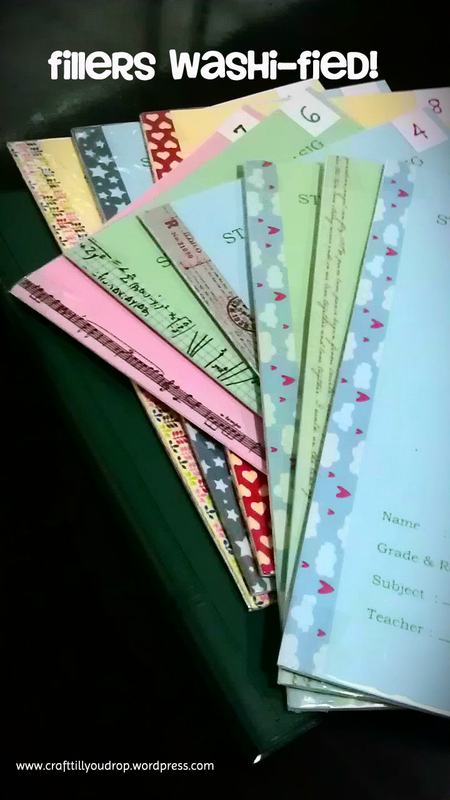 individually wrap them in plastic to prolong the poor notebooks’ school life. to make it look a little more fun, i have treated it with some washi love at the spine. washi tapes are heaven’s gift to crafty moms like me. i love that it’s easy to tear, and easy to peel off. i also love the fact that it is available in tons of different designs! i get my stash locally from heykessy they carry a good amount of design themes. note though that once you start shopping for washi, you just can’t stop!